He aquí los pensamientos aleatorios de un epistemólogo andante. I dream of a world where chickens can cross the road without having their motives questioned. As of June, 2013, I have assumed a new identity: I am a cancer survivor. "Plus ça change, plus c'est la même chose." "Sometimes I wonder why I even bother to soliloquize. Where was I?" - the villain Heinz Doofenshmirtz, in the cartoon Phineas and Ferb. My name is Jared Way. I was born in rural Far Northern California, and became an "adoptive" Minnesotan. I have lived in many other places: Mexico City, Philadelphia, Valdivia (Chile), Los Angeles. And for 11 years, I was an expatriate living in South Korea. In the summer of 2018, I made another huge change, and relocated to Southeast Alaska, which is my uncle's home. For many years I was a database programmer, with a background in Linguistics and Spanish Literature. In Korea, worked as an EFL teacher. In June, 2013, while I was in Ilsan in South Korea, I was diagnosed with cancer, and underwent successful treatment. That changed my life pretty radically. Currently, you could say I'm "between jobs," somewhat caretaking my uncle (to the extent he tolerates that) and getting adapted to life in rural Alaska after so many years as an urban dweller. These bloggings, then, have been my random jottings on the subject of my mostly pleasant life among the Quasi-Confucian Cyber-Industrial Paleolithic Peninsulites of Lower Far Siberia. I started this blog before I even had the idea of going to Korea (first entry: Caveat: And lo...). So this is not meant to be a blog about Korea, by any stretch of the imagination. But life in Korea, and Korean language and culture, inevitably have come to play a central role in this blog's current incarnation. Basically, this blog is a newsletter for the voices in my head. It keeps everyone on the same page: it has become a sort of aide-mémoire. For a more detailed reflection on why I'm blogging, you can look at this old post: What this blog is, and isn't. If you're curious about me, there is a great deal of me here. I believe in what I call "opaque transparency" - you can learn almost everything about me if you want, but it's not immediately easy to find. I have made the realization that happiness is not a mental state. It is not something that is given to you, or that you find, or that you can lose, or that can be taken from you. Happiness is something that you do. And like most things that you do, it is volitional. You can choose to do happiness, or not. You have complete freedom with respect to the matter. "Ethical joy is the correlate of speculative affirmation." - Gilles Deleuze (writing about Spinoza). Like most people, I spend a lot of time online, although I try to limit it somewhat. Here is a somewhat-annotated list of the "places" where I spend time online. I spend about half of all my time online reading Wikipedia. It's why I know stuff. I get most of my world news from Minnesota Public Radio which includes NPR, BBC and CBC, depending on when I listen. Korean news in English, with a conservative bias thrown in for free: The Korea Herald. I use the Korean dictionary many times every day: Daum 영어사전. Humor and Tech News: The Register. Understanding our postmodern world: Television Tropes. I don't really "do" social media. I have a membership at Facebookland but I never log in there. I don't like it. I have a membership at The Youtubes but I mostly use it for work. I also listen to music on youtube, frequently - I prefer it to typical streaming services, for example. Cat videos and other internet novelties: Laughing Squid. A Diversity of Blogs - I read these a lot. Economic and centrist politics: Marginal Revolution. "Rationalism" and vaguely libertarian politics: Slate Star Codex. Liberal Politics: Lawyers, Guns, Money. Philosophy (with liberal political slant): Crooked Timber. Philosophy (with libertarian political slant): Bleeding Heart Libertarians. Korean culture: Ask a Korean. Excellent writing: Justin Erik Halldór Smith. Philosophy, random linguistic and political observations, expat life of a Californian of my generation. More excellent writing: Blogarach. This is the reincarnation of IOZ, which is referenced in many of my blog posts from years ago. Design history and bibliophilic pursuits: Ptak. Geofiction - this has evolved into a significant "hobby" for me. I like to draw imaginary maps, and there is a website that has enabled this vice. I worked as a volunteer administrator for the site OpenGeofiction on and off for a few years. I created (but no longer maintain) the site's main wiki page: OGF Wiki. I am not currently working as administrator but I remain active on the site. The above work has required my becoming an expert in the Openstreetmap system. Openstreetmap is an attempt do for online maps what wikipedia has done for encyclopedias. I have considered becoming an openstreetmap contributor, but I feel that my current location in Korea hinders that, since I don't have a good grasp Korean cartographic naming conventions. TEFL - my "profession," such as it is. Online English Grammar reference Grammarist. Useful for settling disputes over grammar. I get ideas for debate topics from debate.org and from Intelligence Squared - Debates. I went to visit the craft brewery owned by my brother-in-law. It’s pretty interesting that he has this business. I tasted a few of the beers he makes there, and I bought a case of porter which I might give away as gifts or drink at some point. 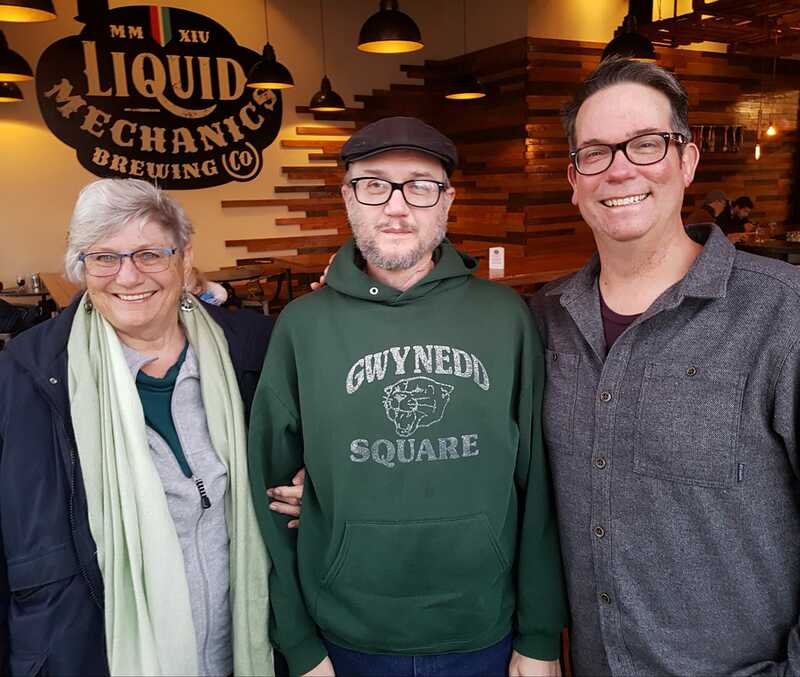 Here is a picture of Wendy, me and Eric at the brewery, called Liquid Mechanics. Later, I had dinner with my sister Brenda and her two kids (well one – Sarah wasn’t joining for dinner) at their house. It was nice talking to my sister.